On Thanksgiving weekend, I'm not only Thankfully Reading but also thankful for my blogging friends. In that spirit, I'd like to acknowledge some awards that have come my way and to alert you to four blogs that are on my regular blog-reading circuit. One thing I love about the blogging community is that it crosses international boundaries and spans oceans. 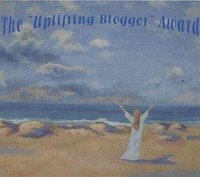 Carolyn from Book Chick City and Alice from Hello, My Name Is Alice both gave me the Uplifting Blogger Award. Carolyn is a UK blogger and hasn't been blogging very long, but she cranks out great book reviews, author interviews, and is even hosting two reading challenges! Alice lives in Petaling Jaya, Selangor. We overlap in a lot of areas, such as books and photography. It's a little crazy for me to put my name in the same sentence as hers though when it comes to camera work. Alice is an awesome photographer! Kaye from The Road Goes Ever Ever On gave me an award she designed to celebrate her blogoversary. Kaye is another blogger who is active in both the book blogging community and the photography community. I think I discovered her blog through Wordless Wednesday. Once I saw her hobbit banner picture, I knew we'd be blogging buddies. Amy from Passages to the Past gave the Honest Scrap Award. Amy is the historic fiction queen, and her blog is a great source of industry news, author interviews, and book reviews. I love her feature about castles. This award comes with a meme; I'm supposed to reveal 10 honest things about myself. I let weeds take over my gardens this past summer. I look forward to my birthdays. I can't carry a tune and refuse to sing in public. I wore braces (on my teeth) when I was in my late 30s. I drove my last car for 17 years. I wish I had a wood-burning stove. Instead of passing these awards along, I'd like to encourage you all to visit Carolyn, Alice, Kaye, and Amy -- I bet you add their blogs to your reader. Congratulations on your awards! After reading your 10 honest things, I see that we're a lot alike! I love the idea of encouraging us to visit the bloggers (which I am happily off to do as soon as I finish this comment! :) Congrats on your awards! Congratulations on the awards and for turning me onto a new blogger (Kaye from The Road Goes Ever Ever On) that I was not previously aware of! You are deserving of all of these awards. You are a pillar in our community! I love your honest list...we have more than a few in common! Congrats on your awards! They are all well-deserved! Congratulations on the awards! Love the 10 honest things - we share several, including braces in our late 30's! Congrats Beth on all of your awards - they are very much deserved! I love your answers to the 10 things about you. The only time I sing in public (well, not so public) was during karaoke session. Congrats on your much deserved awards. We have much in common - 1,2,5, 9 & 10!! Congrats on all the awards - well deserved. Hope you had a great weekend with Thankfully Reading. I thought it was fun!